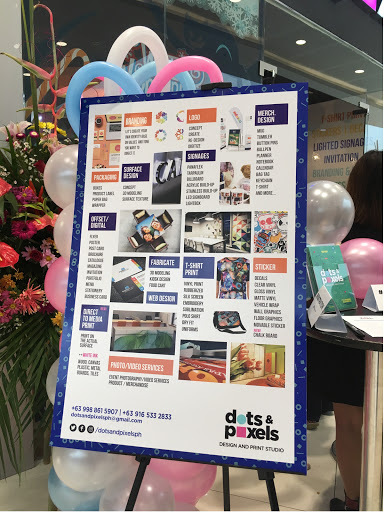 Dots And Pixels finally opens its doors at the 5/F of SM Megamall Fashion Hall and it is my first time to attend an opening of a printing shop, and so I thought. Well dear readers they are not the usual printing shop that we go to, they specialize in Tarpaulins and other printing needs like posters, photos, business cards, event shirts, name it they can do it. But what interests me more was they can actually do stickers, not the ordinary ones, stickers that can be seen both ways or through the glass and the one thing I am truly excited about is the kind of high end stickers they can actually create for walls. 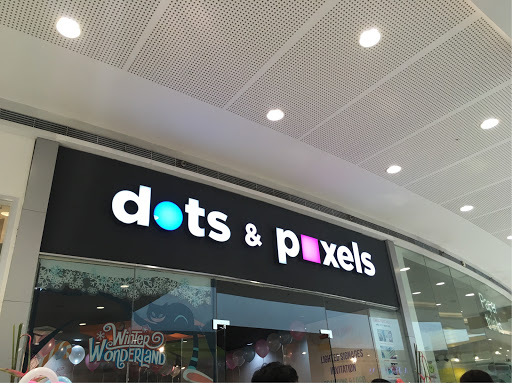 You see in one of my previous post, I shared our new project that will be up in 5 years, and as early as now I've been looking into furniture, paints and what nots for our future home and I am just so glad that Dots And Pixels can help me in the future like "in 5 years" lol! Meet Jengjeng, COO (child of owner haha!) she is the one who is really into this art type of business, we talked about their different services like if you plan to create a business and you are unsure on how it would look like, or wanted a theme for a room but because you have limited space you have uncertainties, Dots and Pixels could actually help you with anything, all you have to do is drop by at their shop and they'll help us take care of our worries. No data plan? Always searching for the nearest wifi hotspot? CLiQQ is here to save the day! All you have to do is search CLiQQ on Messenger to access CLiQQ Wifi at any 7-Eleven store. It’s a hassle-free way to stay instantly connected, browse your favorite sites and access your apps. CLiQQ on Messenger allows you to convert points earned from your purchases to data! Just search for CLiQQ on Messenger and sign up for an account for free. Start chatting with CLiQQ to set up your account. With 7-Eleven’s new innovation, no need to worry about not having enough space on your phone for another app! By making the CLiQQ loyalty program available on messenger, an app most people know and love, earning rewards has never been easier. New members get 70MB of free data for CLiQQ Wifi when they register their account using their mobile number. Points can also be used to top up data, where 1 point = 1MB. Since every 7-Eleven store in the Philippines is a CLiQQ Wifi zone, customers can easily access the internet by using the WiFi feature and connecting to the hotspot. To connect, simply turn on your phone WiFi settings and connect to CLiQQ WiFi hotspot. Aside from this, customers can start earning points, e-stamps, and raffle entries, just by presenting the barcode generated by CliQQ on messenger every time they buy at 7-Eleven. Every P50 worth of purchase earns you a point. Points earned can be used to redeem products on the rewards catalog. Points or e-Stamps can also be used to redeem limited edition collectibles, and participate in different raffle promos. Not only that, CLiQQ on Messenger now makes it easier for customers to transact, all with a CLiQQ of a button. It’s so easy! Update your profile, check your balance and current points, view the latest reward catalog, and redeem all inside Messenger. Never miss out on points again by having your CLiQQ barcode on your phone when you visit 7-Eleven. Stay connected, stay updated with the CLiQQ on Messenger! Start chatting with CliQQ on Messenger now! Vitacubes vitamin-candy had a grand family day event held at the Active Fun, BGC and of course our family is present. The event was attended by mostly Mommy Bloggers like me who is also curious and excited at the same time. It was my first encounter with Vitacubes and I was immediately convinced that this could be a good alternative or substitute for candies or junk food. Vitacubes is packed with vitamins and minerals, it has different fruity flavors that kids will surely enjoy and it is very soft and chewable I would not be afraid that my toddler might accidentally choke on it. So anyway, we had an afternoon packed with activities for kids such as games, magic show and a one hour pass to play at Active Fun, indeed it is a bonding day for families, thanks to Vita Cubes. By the way Vita Cubes pack comes in a pack where it is individually wrapped per piece and the usual snack type packaging, get these awesome snacks for your kids in leading groceries and supermarkets nationwide. individuals manage their logistics needs so they can focus on things that really matter to them. Our value proposition for on-demand logistics needs is better than what is available in the market." Colgate-Palmolive Philippines celebrates 90 years of operations in the country, providing generations of Filipinos with quality brands for oral care, personal care and home care such as Colgate, Palmolive, Tender Care, Gard, Axion and Ajax. The Palmolive Company Philippines was established in 1926 with an office in the Binondo district of Manila with just five employees. Products sold during those days included Pompeia cosmetics, Octagon laundry powder and Crystal White laundry bar. Soon after, Ajax powder cleanser was introduced to the market and, in 1949, the company was incorporated as Colgate-Palmolive Philippines, Inc.